On the occasion of the Day of Independence of Armenia. 50 people in wheelchairs along with 50 volunteers cross the distance from the Opera House up to Mother See of Holly Echmiadzin (22km). The aim of the event is to show the public at large that people with disabilities exist and are full members of our society. 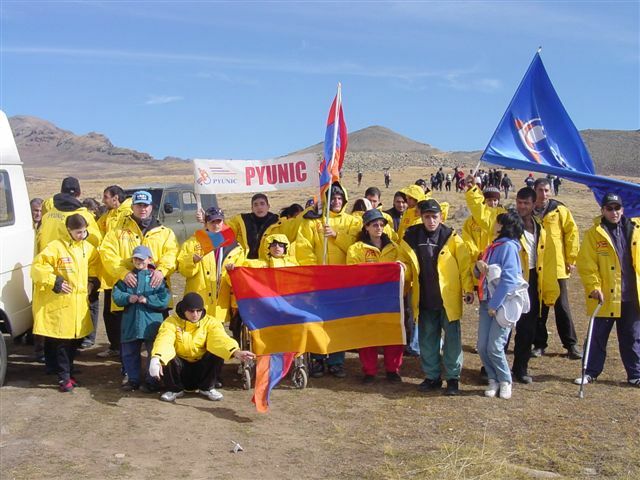 On the 21st of September, on the Day of Independence in Armenia, Pyunic organizes event called “Ascent to Mount Aragats.” 35 people with disabilities climb the southern top of Mount Aragats (4080m), demonstrating strong will power and determination to overcome difficulties. Pyunic organized two flash-mobs, “On the Wheels” and “Don’t Occupy my Parking Place,” in cooperation with Unison NGO and the Armenian Network of Independent Living. The aim of both flash-mobs was to bring to light the issues that impede people with disabilities to become fully integrated members of our society. The first one was raising the issue of universal design, the other the right of parking, as in the majority of cases disabled parking spots are occupied by non-disabled drivers. In October, Pyunic participates in the celebration of Day of Yerevan. The aim of the event is to show that people with disabilities are full and equal members of the society. On June 21 beneficiaries of Pyunic in wheelchairs participate in the celebration of Olympic Day. More than 500 people, including runners and cyclists, participate in the event, which starts in the Republic Square and ends in Stadium Hrazdan.